Location for image above: The ‘Art Box’ gallery created by Frankie Rockett and Violet Sweetwater. Aviaos Shadowcrawler v.2 (Red Female) avatar created by Flea Bussy (tail detached for photo above). Interactive homage to Jim Sweet’s ‘Spikeball’ created by Frankie Rockett and Violet Sweetwater in Second Life. See Cyberloom’s earlier visits to the Art Box: Halo Feels A Little Suspicious… Elephant Girl Pays Homage To Helmut’s Bunny Girl. Whistler’s Mother Was a Pirate and Vitruvian Woman. Strangers Also Dance is an exhibition of the ‘Interactive Work’ of Glyph Graves and it finishes today (July 15, 2009). IBM provided the exhibition space on their public island IBM 2, and Glyph took full advantage of the space generously given to him. 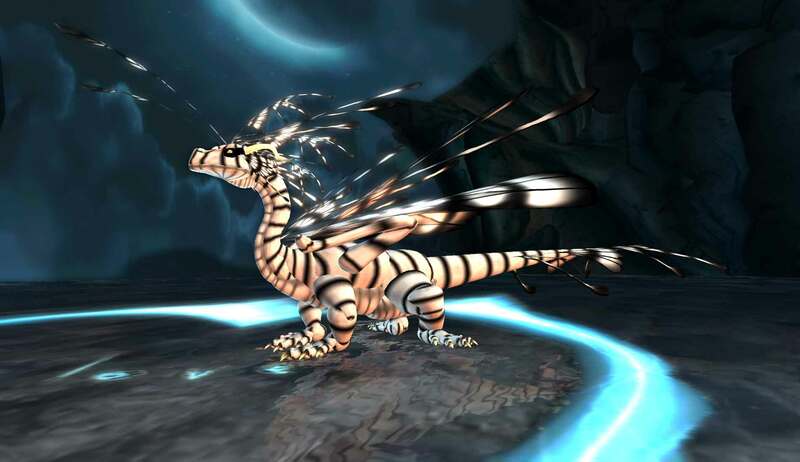 He also took full advantage of the Second Life elements of wind, water and Windlight. It seemed particularly appropriate to don the gelatinous fronds of Flea Bussy’s jellyfish avatar to visit this fantastic exhibit. As I moved around the installation plants gently swayed towards my avatar or changed color, while others moved to the Second Life wind and water currents. 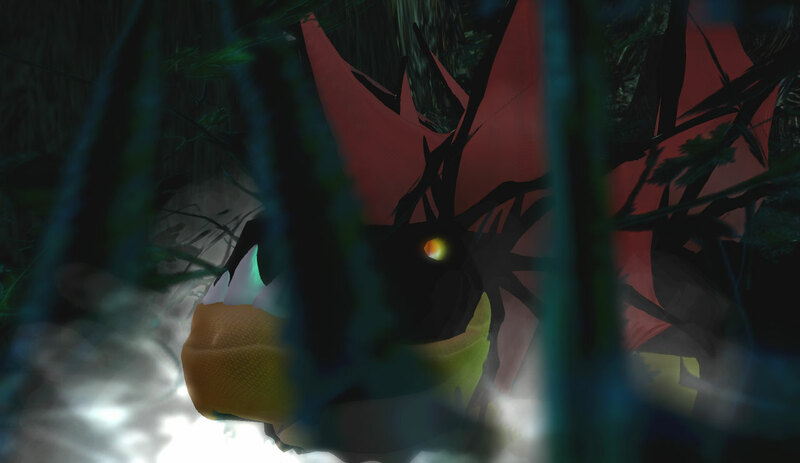 There is strange atmosphere to the swamp with all these alien plants interacting to your avatar presence. The plant creatures summoned me to come close with hypnotic gestures and eventually I was drawn into a great moving light, or was it an organism? The creature of lights seemed to fly me through the air yet I emerged far below the sea. All wonderfully strange! For more images from the show visit the IBM Exhibition space on flickr where you can see Glyph Grave’s photos of his work. I have a number of dragons residing in my inventory that need to be exercised fairly frequently or else they vandalize my landmarks and clothing. 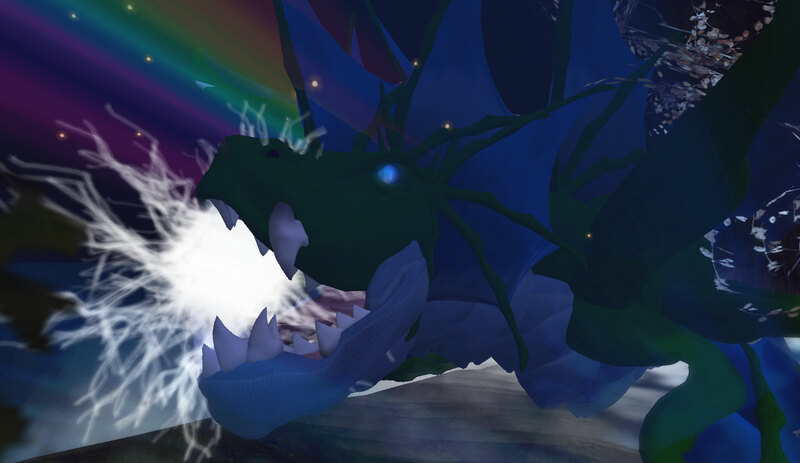 I decided to take these dragon avatars for a flight, and a walk, around Templum ex Obscurum… a tricky enterprise! I accidentally burnt down a tree or two, and the grass was singed in a couple of places. 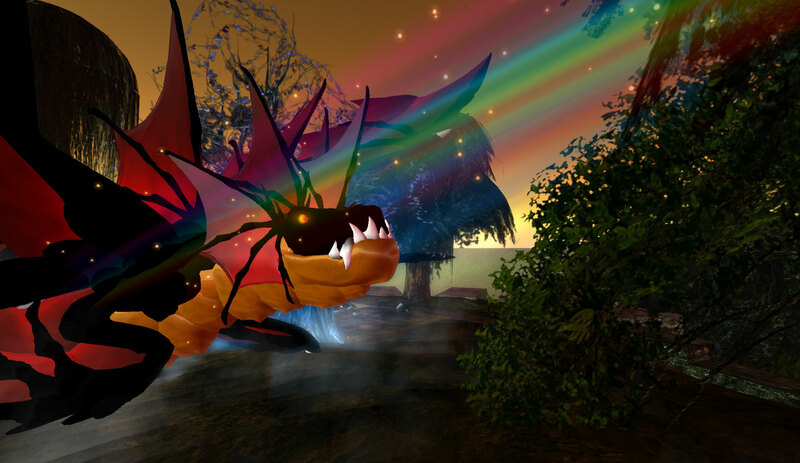 Location for dragon photographs Templum ex Obscurum in Second Life™. 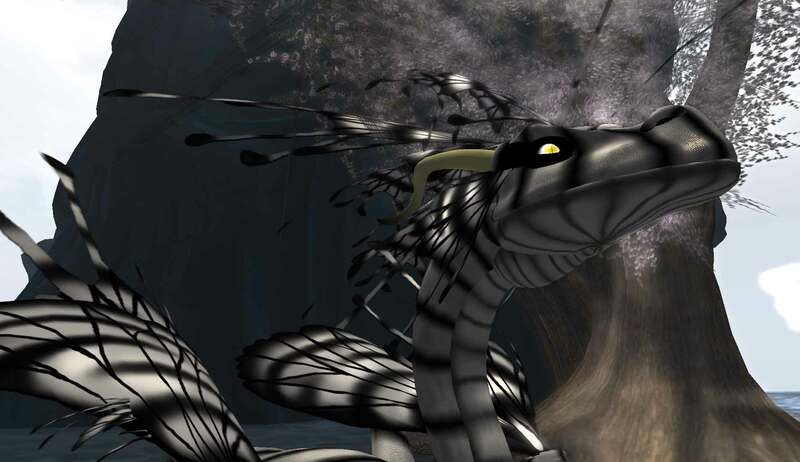 Dragon avatars created by Flea Bussy of Grendel’s Children. For more images of Templum ex Obscurum visit flickr. 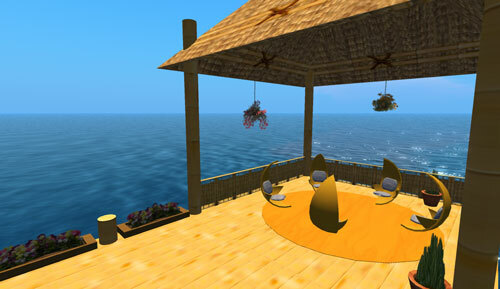 This site is displaying a fabulous range of images all taken at this one location in Second Life. Please read Not Possible In Real Life for more information about this photographic project to record Baron Grayson’s Templum ex Obscurum . 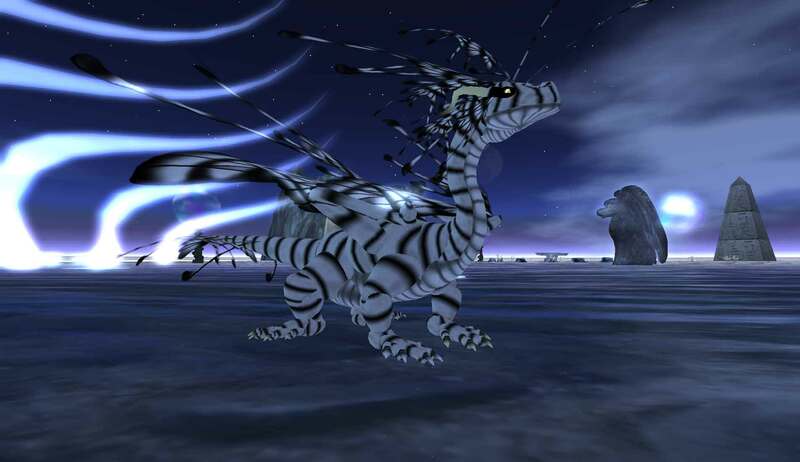 I have been thinking you need chaos in your soul to create an avatar, to immerse yourself in synthetic worlds, and to play like an child in cyberspace. Children who played in the mud of London’s River Thames at low tide were called ‘mudlarks’… We are today’s mudlarks, the children of MUDs (Multi User Domains) in virtual worlds. Some people ‘take off’ when freed of the constraints of the conservative, physical world. They build in pixels, re-shaping the chaos of life; translating the physical world into visual metaphors through creative concentration. 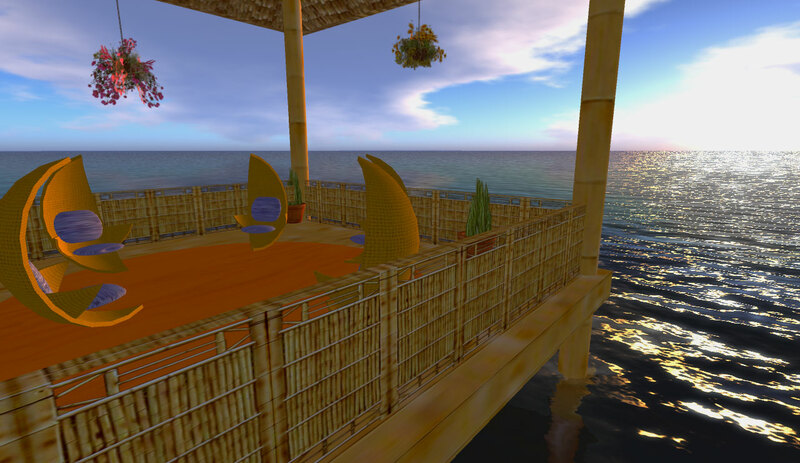 An avatar called Baron Grayson unleashed his imagination in Second Life to construct an island called Templum ex Obscurum. He is, according to his Second Life profile, enduring the chaos of a furniture move in the ‘real world’. While he is ‘away’ avatars with virtual cameras are running around Templum ex Obscurum snapping away like Olympic athletes at a closing ceremony. There are two reasons for all this digital activity, the first being that Templum ex Obscurum is an amazing immersive experience; and the second reason is Bettina Tizzy. 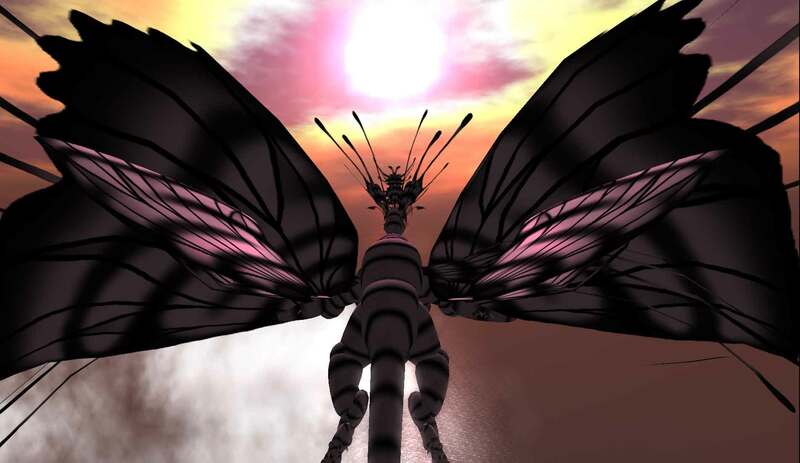 The empress of The Not Possible In Real Life movement in Second Life is running a flickr page featuring photographs of Grayson’s work. 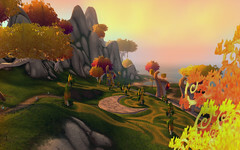 She has challenged photographers, and machinima makers, to capture this atmospheric world. I decided to add my own pixels to the photo party and will be posting more photographs of Templum ex Obscurum over the next few days. My avatar will get to play crazy dress up games as I explore the chaos of my own soul and the photogenic island. ‘Information overload’ has made its way into Wikipedia, this makes sense as Wikipedia’s success is largely due to its ability to focus on specific information quickly. Of course, there continues to be a debate about the quality of Wikipedia, and whether academia can accept Wikipedic references in student papers.In the meantime Wikipedia is striving to upgrade its credibility by gathering together solid sources and citations for its communally created entries. cyberloom blogging whilst seated on Nebulosus Severine's TV sets. 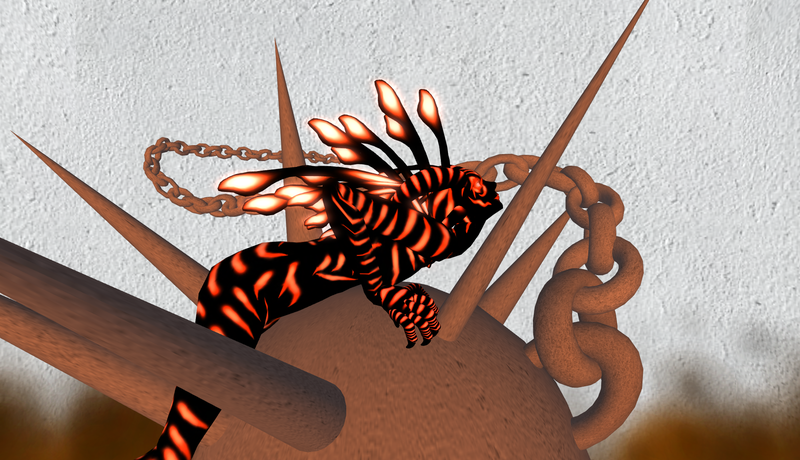 Nebulosus' installation 'The Culture of Television' can be seen for just a few more days at Arthole in Second Life™. That’s enough Wikipediapology! I will now point you to the wiki’s entry on information overload , here you will find the analogy of ‘low signal-to-noise ratio’, an apt descriptor! The term addresses how it is becoming increasingly difficult to discern the useful message from the mass of information swirling all around us. If your work regularly sends you out into the Internet you can feel as though you are trudging up sand dunes all day. (Two steps forward and one step backwards.) Or perhaps you feel as though you are trying to construct a sandcastle? Trouble is building in dry sand is tricky! It is hard to create a coherent shape out of all these random, tumbling pieces of digitized text. Blogging helps bloggers to organize the information they are interested in. A blog can act as an information filter, a file for references and web links. Blogs can work as a focal point for personal ideas and reflections. At the same time blogs have become part of the problem by adding yet more ‘blah, blah’ matter to the information overload. Wikipedia credits Jakob Nielsen for coming up with the expression ‘information pollution’, a term that conjures up visions of felled blogs floating down clogged virtual rivers. Oh well… not to worry! Just think, where will all our blogs go if there is a massive, lasting power failure? Without electricity everything will just vanish away. Dinosaurs probably thought they had a pretty solid grip on existence but look what a falling meteorite did to them! What’s another blog going to matter? Just as dinosaurs altered the landscape with their big feet, bloggers en masse are influencing the ‘infosphere’ with our collective blog jamming! 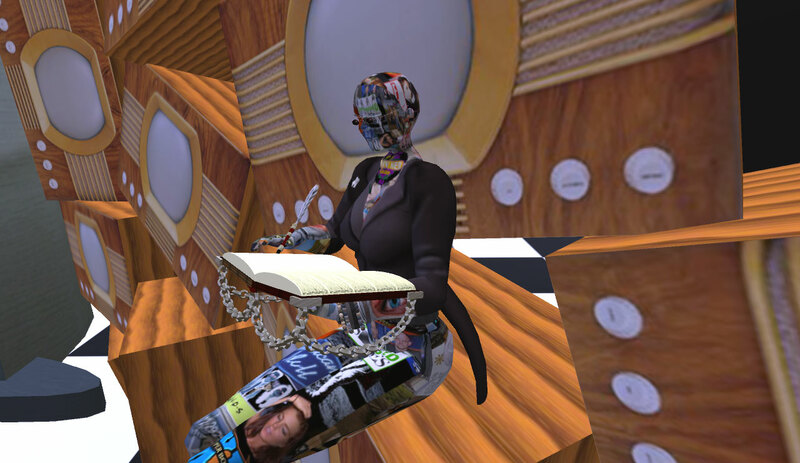 Nebulosus Severine’s installation ‘The Culture of Television’ can be seen at Arthole in Second Life™. Head over there quickly as the exhibit ends soon. 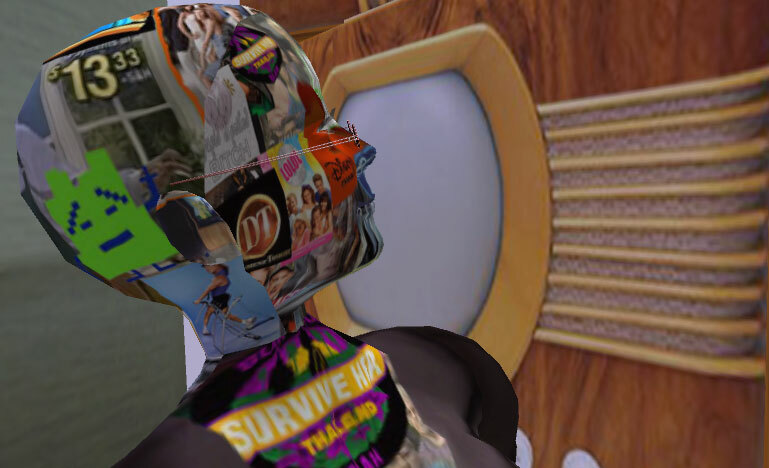 Don’t forget to collect your free TV avatar while you are there! 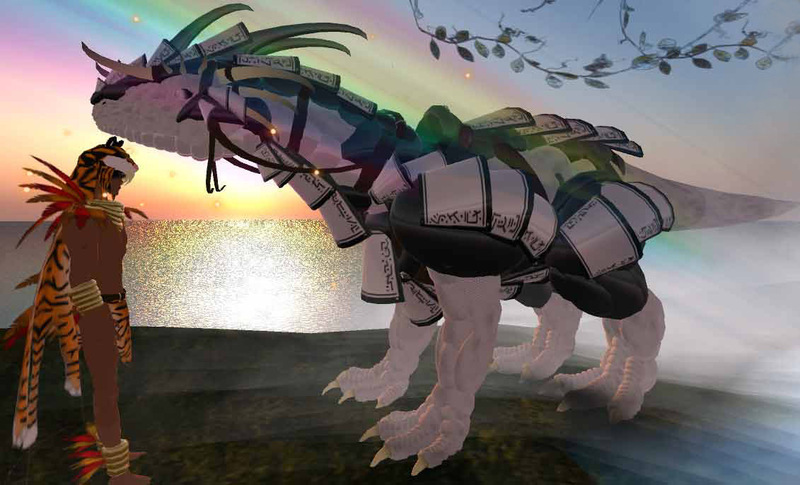 cyberloom’s notebook was created by Flea Bussy and can be purchased at Grendel’s Children. New chairs (created by cyberloom) & hanging baskets ( by Honour MacMillan) lending social presence to a virtual meeting space. I have been experimenting with building in Second Life! Just a tiny little bit! Nothing ambitious! I am slightly embarrassed about my modest attempts when I know so many fabulous builders. On the other hand there are others who think that it will take years to master so they avoid it altogether. That is, some people think you need to know about programming and ‘whatnot’ to build, or you must be a bit clever with computers and technology generally. Well, its easier than you think! Another thought is to beware ‘experts’, those who mystify what they do to make it seem more difficult! I will be teaching a class introducing people to Second Life in September and this has motivated me to start building classroom spaces. At first I wistfully wished to be very stylish, and monochromatically beautiful, along the lines of Alpha Auer’s Syncretia Sim. 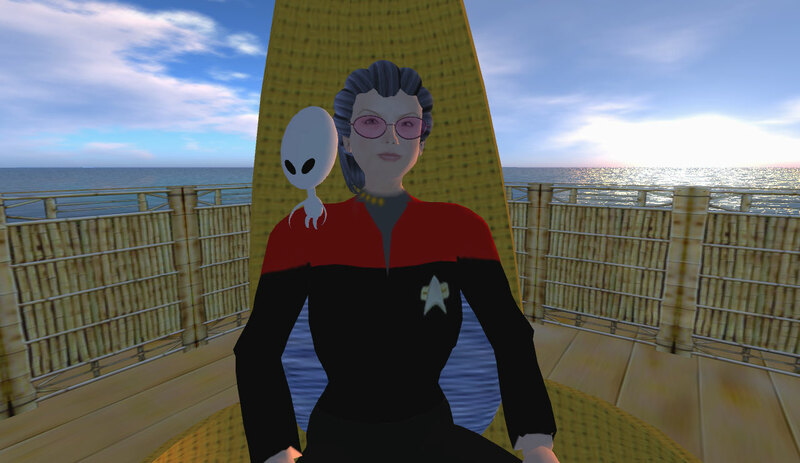 But the truth is I can’t pull off such sophistication in Second life or Real Life (sigh…) I quickly gave up such notions in favor of creating a friendly virtual place for my students. This dabble at very modest building was intriguing as it had me wondering about the social presence of virtual furniture. Just think how a spiky chair would look compared to one with a cushion. The effect would be different, a distraction. No spiky chairs then! The social presence of furniture is intriguing, it got me thinking how there are layers to the social presence of virtual environments. 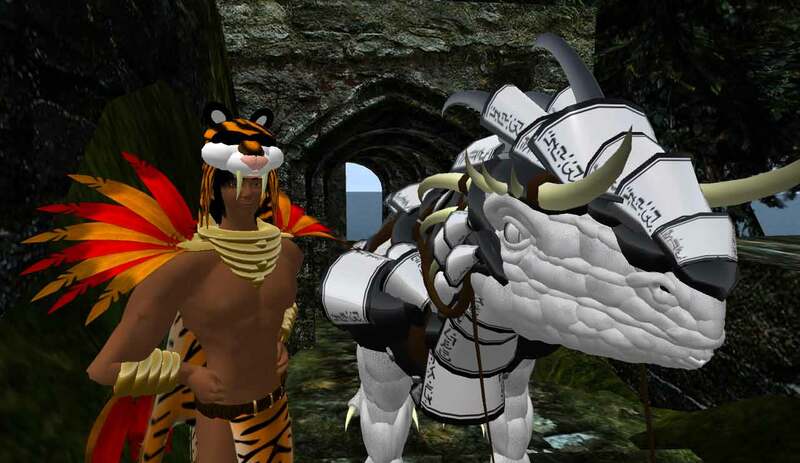 Second Life bloggers (including myself) have spent endless hours attempting to comprehend the social presence of our own avatars (virtual navel gazing?). Taking a look at the effect of virtual environments, and what goes into creating their atmosphere, is like peeling away another layer of the social presence ‘onion’. For some reason, I found that it helped me to wear a Star Trek uniform, and take advice from a little alien called ‘Greypet’ as I twirled hollowed-out prims. Maybe it’s time for more virtual navel gazing? No time just now. I have more building to do! I am quite proud of my Second Life Landmarks gallery with pictures hanging on walls of water, maybe I will blog about that sometime? Though it sounds more exciting than it is, but you have to start somewhere after all… eh, Greypet? Star Trek clad chair builder with alien pet. ‘Greypet’ created by Flea Bussy at Grendel’s Children. Flower baskets created by Honour and available at Aintree Common.